Sea Eagle SE 330 Deluxe Kayak Review – Is it The Best Budget Inflatable? 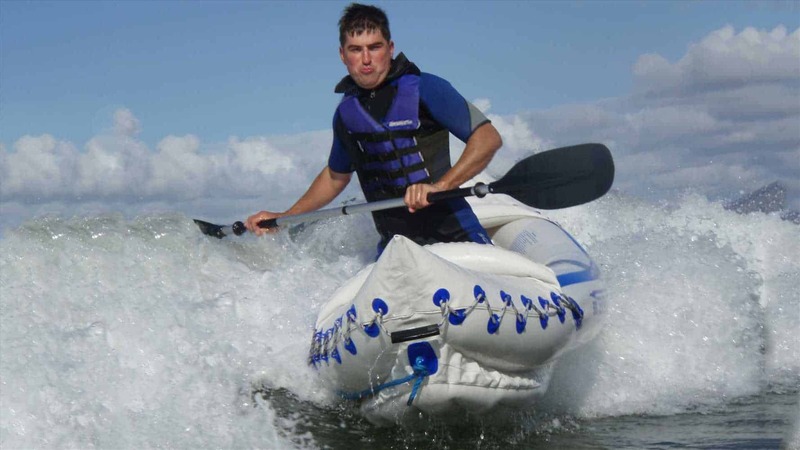 Sea Eagle is a pioneer in the inflatable kayak industry. In Fact they have been perfecting their craft since 1968! Over the years they have perfected the art of making inflatable kayaks which is a big reason why they are one of the industry leaders today! The Sea Eagle SE 330 Deluxe is no stranger to that philosophy. One of the best options available in terms of durability and affordability The Sea Eagle SE 330 is a great versatile option for some fun on the water. This kayak can be used both as a solo and a two person kayak for a variety of different waters including Class III Rapids, Calm lakes and coastal Oceans! This kayak can tackle a variety of different conditions that is thrown its way thanks to its durable K-80 Polykrylar Hull Material. Infact Sea Eagle are so confident with their inflatable kayaks that they attach a 3 year manufacturer warranty on their kayaks. A few years ago Sea Eagles decided to uplift it’s floor to allow you to sit higher in the kayak and create greater durability with the floor. They created the I- beam floor which was met with different reactions among customers. On one hand it helps further the already impressive durability of this kayak and allows you to sit higher up to make paddling easier. On the other it makes the kayak more susceptible to being pushed around by the wind. This is a big problem with most inflatable kayaks but when you have it raised even further up you create more surface area for the wind to push against. Many people are impressed with how the Sea Eagle is so durable. Some people have had this kayak for well over 10 years and some even 20! Others have tested Sea Eagle on it’s claim of being able to tackle Class III Rapids and have come out satisfied. I have also heard of people tackling 3 to 5 foot waves and this kayak seems to be on top. The SE 330 Deluxe is also a very underrated fishing vessel. Inflatable kayaks tend to make less noise than hard shelled kayaks so you can sneak up on fish and catch them by surprise! You are also seated high enough where you can spot fish easier in clear water. People who have owned the Sea Eagle 330 seem to enjoy the open layout and state that you can fit a good amount of gear in it. It is also easy to set up and takes less than 10 minutes for full setup time. Many customers were blown away by Sea Eagle’s 3 year manufacturer’s warranty which is rare among many inflatable kayak manufacturers. Most people have mostly good things to say about the Sea Eagle 330 kayak but some of the most common complaints were directed at how easily the boat gets pushed by wind. The Sea Eagle SE 330 Deluxe is raised higher than many kayaks on the market, and it’s inflatable. That combination makes it easy to be pushed around in wind over 3 mph. Tracking ability is a bit of a mixed bag with this watercraft. Some people swear by it while others are not very happy with it. Ultimately the difference between the two is how much kayaking experience you have and how many different models customers have tried and owned.